What are your New Years resolutions? My boring, traditional one is to run everyday because right now I have been working out 3x/week, and I really want to get in top shape! Oh, and of course work off all of those holiday indulgences. My second one is to try to find new, unique, amazing recipes to share. I was introduced to these fluffy whole wheat banana walnut pancakes on my trip up north to Mendocino, CA a few weeks ago. 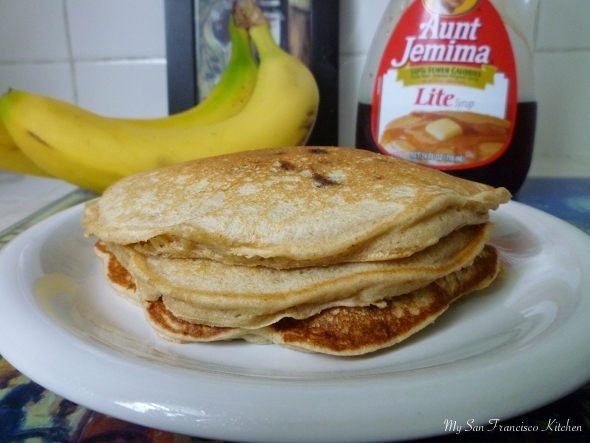 Whenever I used to make banana pancakes, I would slice up the banana and drop them onto the batter in the skillet. They were “just ok”. When I had this kind where the banana was blended in, I was surprised by the deep banana flavor and how well the walnuts go with this yummy breakfast treat. This recipe is so easy, just throw all of the ingredients into your blender. I just got a Magic Bullet for Christmas from my brother, so I used that to mix the ingredients. I use applesauce instead of vegetable oil, and I also add chocolate chips at the end just because I am a chocolate addict. Enjoy! Tip: Make on weekends and store in an airtight container in the freezer to enjoy during those busy weekday mornings. 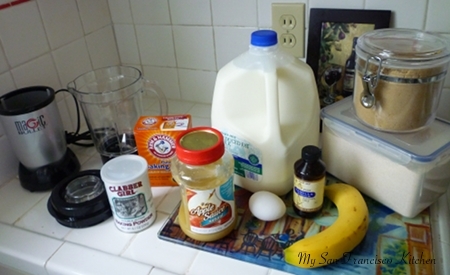 Add liquid ingredients to Magic Bullet or blender, followed by dry ingredients. Blend until everything is mixed well. Stir walnuts and chocolate chips into the batter with a fork. Heat a medium-sized skillet on medium heat. Grease with cooking spray or butter. Once heated, pour about ¼ cup batter onto skillet. When holes are formed, flip pancake to brown other side. See this post on Recipe Roundup! This entry was posted in Breakfast and tagged bananas, chocolate chips, pancakes, walnuts, whole wheat. I hope you can successfully fulfill your resolution 🙂 As for these banana pancake I know I would just love it. Banana is one of my fav fruit! Aja Perrin on Best Chocolate Chip Pancakes!